Reference image. 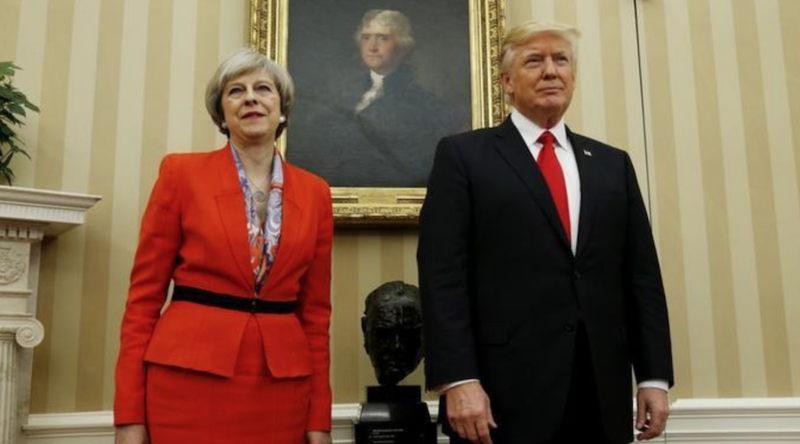 British Prime Minister Theresa May and U.S. President Donald Trump on January 27, 2017. Photo by Kevin Lamarque, Reuters. U.S. President Donald Trump has spoken to world leaders about his planned tariff hike on steel and aluminum and is not considering any exemptions to the measure, Commerce Secretary Wilbur Ross said on Sunday. "I know he's had conversations with a number of the world leaders," Ross said in an interview with ABC's "This Week." In one of those conversations with other countries' rulers, Trump heard that British Prime Minister Theresa May had a "deep concern" about the tariffs. According to a spokesperson from May's office, the PM noted that "multilateral action was the only way to resolve the problem of global overcapacity in all parties’ interests." China, on the other hand, said it does not want a trade war with the United States. However, Zhang Yesui, a spokesman for the Chinese parliament, said that the Asian giant will take measures to safeguard its interests. Back in the U.S., the top Republican lawmaker overseeing trade policy said all fairly traded steel and aluminum should be excluded from President Trump's tariffs, especially those of NAFTA partners Canada and Mexico. Kevin Brady, chairman of the House Ways and Means Committee, made his remarks shortly after Wilbur Ross' interview. Mexico and Canada have both threatened retaliation if Trump goes ahead with imposing the metal tariffs later this week.